Sedeer el-Showk is a Finnish/Lebanese freelance science writer and editor living in Morocco. Sedeer el-Showk | Sedeer el-Showk is a Finnish/Lebanese freelance science writer and editor living in Morocco. Searching for Balance: Water Use in Morocco Growing water scarcity and more frequent drought in Morocco are driving innovative local projects such as fog harvesting in the coastal mountains. I was raised between the desert and the sea. To the south and east, mountains draw moisture out of the air coming in over the Atlantic and send it tumbling back down to the coast. I grew up on my parents’ farm in Morocco’s green coastal strip, in a country where many people have yet to come to terms with the reality of water scarcity. People here talk about rain. In years with too little rain or snowfall, farmers do poorly, and the strain often ripples through to the rest of the economy, especially during a string of dry years. Given its prominence in our awareness, I was surprised to discover that agriculture makes up only 15-20% of Morocco’s GDP. Nevertheless, agriculture is a major driver of the Moroccan economy, accounting for four out of every ten jobs and feeding a range of support industries, from suppliers to merchants. Agriculture also has effects which are not captured by official figures, such as providing work for day laborers or keeping children on small family farms rather than in school. Underpinning this entire structure, and fueling it, is water. Despite this, people do not really save water. 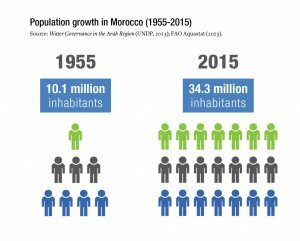 Morocco’s population has more than tripled since 1950, and though there is only a third as much water available per person as there was 50 years ago, water availability ranks low in the concerns of most people, who are not yet suffering an acute water shortage. 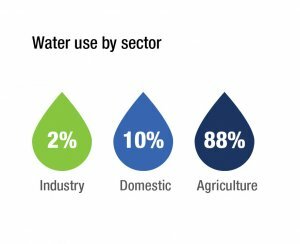 More than 85% of Morocco’s water supply is used in agriculture, where inefficient and outdated supply systems and irrigation methods lead to widespread wastage. The same is true in domestic contexts, where saving water is virtually unheard of in most households. “I come from a country with thousands of lakes, but we’re taught to conserve water more than people here are,” my Finnish partner Hannele observed. Growing up, I was never bothered by the lavish use of water I saw, from washing cars and watering lawns to letting the water run while doing the dishes, but now these habits seem strikingly out of place in this arid country. A close friend used to joke about the way shopkeepers “water the sidewalk” to keep the dust down, an image that is difficult to reconcile with Morocco’s ever-encroaching desert. As severe droughts reduced the water level over the last few decades, my parents focused the farm more heavily on our tissue culture lab (where plants are multiplied aseptically on a nutrient gel) and the nursery, rather than crop production. The shift has led to fewer laborers working on the farm, echoing the changes I see on a broader scale around us. When we moved here, the landscape around the farm was unambiguously rural, despite our proximity to Morocco’s capital city, Rabat. Since then, the nearby village has grown into a small town, and low-income housing projects have cropped up around us to accommodate people who have moved closer to Rabat looking for work. 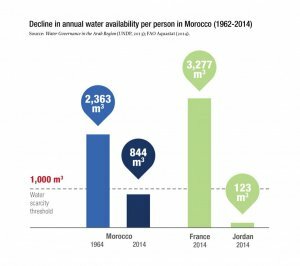 Morocco’s water problems have been intensified by climate change, with particularly severe droughts afflicting the country in the late 20th century. According to a 2014 UN report, Morocco’s agricultural sector has had to weather more than 20 droughts over the last 40 years, including some years with 60% less rainfall than usual, a challenge it has coped with by relying on the country’s extensive network of dams. King Hassan II. The dams have ensured a steady water supply during periods of irregular rainfall and drought, but this stability comes at a cost. Blocking a river’s flow creates a barrier to migrating animals and affects important processes such as sediment deposition, impacting ecosystems above and below the dam. Dams offer a mixed blessing, with the costs largely borne by communities along the river. Building a dam often involves displacing people living upstream in order to create the reservoir, while agricultural villages downstream can no longer depend on seasonal floods to provide water. Two years ago, my partner and I took her father on a trip to Erg Chegaga, a pocket of the Sahara in the southeast of Morocco, near the Algerian border. I looked forward to the liberating silence and crystal-blue skies we would find among the pristine dunes and to the return leg of our journey, when we would visit Lake Iriqui at the desert’s edge. I had been to the desert before, but a desert lake would be a new experience – a unique ecosystem, a border between worlds at the intersection of sun, sand and water. I wondered how salty the water would be. It took me a moment to reconcile my expectations with what we found. The lake was gone. The dry lakebed stretched onwards, the cracked texture of its surface filling the place with a sense of absence. Our guide explained that Iriqui had dried out in the 1970s after the damming of the Draa River, which used to feed the lake. He added that several villages were uprooted to build the Mansour Eddahbi Dam, which was completed in 1972, and the river’s reduced flow also affected villages further downstream. In exchange for these losses, the dam’s 500 million-cubic-meter reservoir supplies irrigation water to Morocco’s ‘date basket’ in the Draa Valley and generates electricity for the valley. 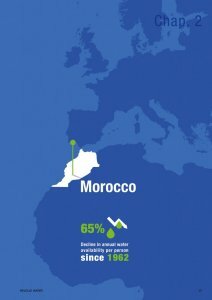 Morocco’s dams have a total capacity of 17.6 billion cubic meters and are used to supply drinking and irrigation water, to provide flood control, and to generate hydroelectric power; the construction of new dams is projected to add nearly 2 billion cubic meters of storage capacity by 2030. 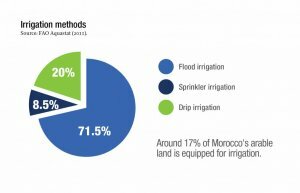 Despite their strengths, dams alone will not be enough to cope with Morocco’s growing water shortage; innovative approaches are needed to prepare the country for increasing bouts of drought and flooding. A pilot project launched last year in the Sidi Ifni province, a mountainous coastal area facing the Canary Islands, embodies the persistence and creativity called for in the face of the planet’s changing climate. To help rural communities in one of Morocco’s most water-poor regions, NGO Dar Si Hmad has adopted a modern take on an ancient technology to catch water droplets from the air. Residents of the mountain villages have traditionally relied on hand-dug wells and cisterns built to capture rain run-off for themselves and their livestock since they are not connected to the national water distribution network. The task of hauling the water generally falls on the shoulders of girls and women, consuming three to four hours of their day and making it difficult or impossible for the girls to attend school. Cycles of drought make the water supply unreliable, and contamination of the open wells creates a constant health risk. For the last ten years, the team at Dar Si Hmad has been working to establish a cleaner, more reliable alternative. “There’s a lot of fog in the region, and that’s a resource that can be used to counter the lack of traditional water sources,” explained Jamila Bargach, the project director at Dar Si Hmad. The idea started when the president of Dar Si Hmad learned about fog harvesting technology through the Canadian NGO FogQuest while living in Canada. Aware of the thick fog that blankets the area for half the year, he saw an opportunity to alleviate some of the suffering caused by water scarcity. With technical help from FogQuest, Dar Si Hmad brought the technology to Morocco and adapted it to the region. “There were a lot of experimental aspects to the work. We measured the water yield every day for about five years to make sure the project was viable. We had to adjust the nets and their orientation according to what we found in the field,” said Bargach. The nets are a mesh which traps microscopic water droplets floating in fog, forming larger droplets that run down to a trough and feed into the network of pipes and reservoirs built by Dar Si Hmad. The fog collectors need regular maintenance to keep them clean and to replace nets torn by the wind. “It’s a Sisyphean job,” said Bargach, but it also offers a chance to involve the community and allay some of their fears about fog water. “The people grew up thinking of fog as a nuisance, a horrible in-between thing, neither wet nor dry,” she said, explaining that they became more comfortable with the idea of using fog water by actively taking part in the work, checking on the reservoirs, helping with construction, and tending the nets since the project’s official launch in 2015. “We had a major inauguration with state officials and our funders, and all the villagers came. It was a huge ceremony of 400 or 500 people. We distributed the water in bottles, and now it is flowing and reaching people every day in their homes,” said Bargach. Before the project, each villager had access to an average of 8 liters of water per day, roughly one-tenth of the average per person consumption in Morocco. In combination with new supplies of groundwater, the collected fog has dramatically increased the amount of water available for each person, and the installation of plumbing has brought the fog water running to their homes, enabling them to build modern showers and kitchens, according to Bargach. The technology has also freed girls and women from gathering water, and Dar Si Hmad has established a school to help them make the most of the time they have gained. 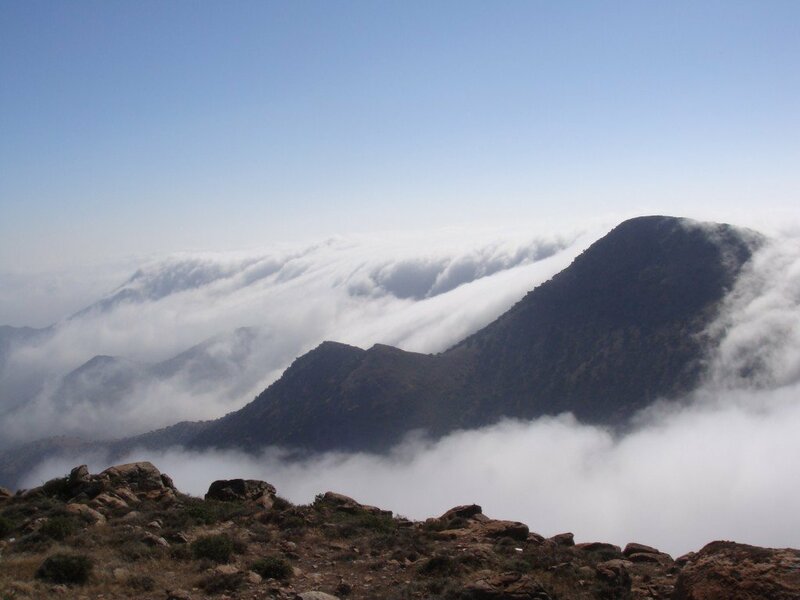 The coastal mountains of Sidi Ifni are blanketed in heavy fog for half of the year making this an ideal region for fog harvesting, Morocco, 2010. Source: Dar Si Hmad.